A toast is a view containing a quick little message for the user. A toast provides simple feedback about an operation in a small popup.It only fills the amount of space required for the message and the current activity remains visible and interactive. 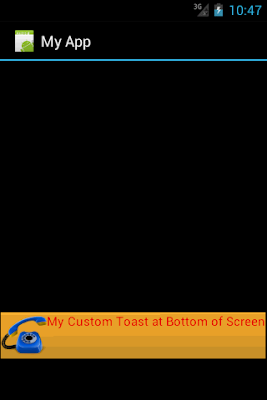 The default implementation of a Toast shows a simple text at the bottom of the screen. We can change this default implementation of Toast , we can change the size , color, style and other properties of the text being displayed in Toast. Not only this we show image and other views in Toast. Even we can set a Layout/ View in toast and can make it more decorated. We can also change the position of the Toast being displayed, we can display it at any place ,top, middle, left, bottom etc of the screen. With the above example we can create customized toast from an xml layout, we inflate the xml layout in our code and do the needfull. 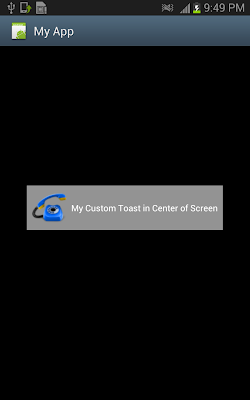 We can also create customized toast without creating xml layout, we can add/select the views at run time runtime and can show in the Toast. This gives us more flexibility to select the Toast Components at runtime. We can also set/customize the time interval of the Toast to show. It has been discussed in next post.